To begin with I was not sure where to store my HTML/JS files in the Android project and what URL to use to load them. JavaDoc help for WebView did not mention how to load local assets into WebView. It turned out that you need to keep all your HTML/JS files in the ‘assets’ folder of you project and load them with URL file://android_asset/. hellooo…. when i try lo load the html page, it shows an error message such that unable lo load… i tried 100 times… but it remains same!!! help…plz…..
What is the exact error message? Have you saved your HTML file in the assets folder, under project root? I got a problem with Android 4.0. Class functions are not called. On previous versions (2.1-3.3) everything worked very well. Have you met such issue in your work? I tried the example code in this post with Android 4.0 and did not see any issue. PhoneCap is Great! Thanx for sharing this tutorial! I am getting an error in the following line in the onStart() method. From the stack trace I see that a mention of DroidGap. Are you using PhoneGap? In that case you do not need to create WebView. PhoneGap creates one for you. 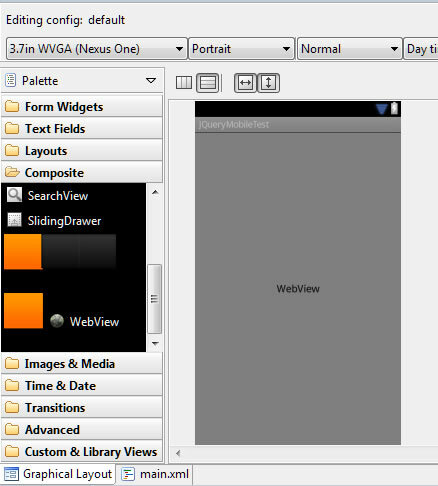 You can access WebView instance of DroidGap from the class extending it e.g. However I am not sure if you will hit the same bug after these changes, because of the bug in the emulator. Yes, it is possible to build Android app using HTML, JS and CSS. Take a look at PhoneGap. It allows you to call device APIs for Contacts, Camera, Metdia etc from JS code. You can use PhoneGap Build to package the application (create APK file). Once you have an APK file, copy it to SD card of the phone and try to open it. This will open up the installer to install the application. Or you can download ADT. It is an Eclipse plugin. You can create an Android project in ADT or using PhoneGap and open it in ADT. Then from ADT you can export the project to create an APK file. Is it possible to interact with the HTML/JS using Java? i.e., i want my UI to be using HTML/JS but want the back end processing to be in Java, like when a HTML button is clicked i can get the event in my Java code and then the Java code send some text or image back to HTML UI to display. When i am execute this program i did’t get output. If any changes required in manifest file. I don’t think I posted a complete application in this blog entry, so not sure which program you executed. However I have created a demo project which you can download and run. Hi I have downloaded your app however it doesn’t solve my problem. in you assets folder you have single html file. However in mine there is one html file and 3 external js files. how could I run them on my phone via webview? and created one apk for android. Loading test.com in webview in this app. 11-21 16:04:16.995: I/chromium(1026): [INFO:CONSOLE(89)] “Uncaught TypeError: undefined is not a function”, source:http://test.com…..
As mentioned in one of my comments above, I have created a demo project which you can download and run.